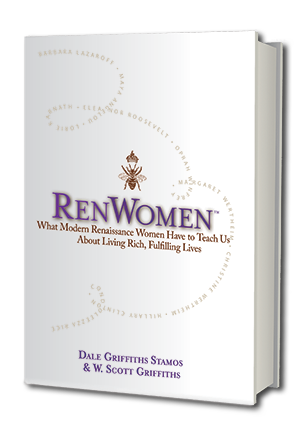 In 2016, Dale ventured out into a new field of writing by authoring (in collaboration with her twin brother, W. Scott Griffiths) the nonfiction book RenWomen What Modern Renaissance Women Have to Teach Us About Living Rich, Fulfilling Lives. RenWomen is an exploration of the lives and lessons of 16 remarkable multi-faceted women working at the height of their abilities. Their lives and unique insights will inspire and guide women in how to reach higher and delve deeper in their own lives. Dale talking about the book. Drawn from in-depth personal interviews, Dale tells the stories of the following women: Hélène Cardona (actress, poet, tri-lingual translator, magazine editor, dream analyst); Kathy Eldon (journalist, film and TV producer, author, founder and director of Creative Visions Foundation); Dale Franzen (former dancer and opera singer; teacher, founder & Director of the Broad Stage) and her daughter, Alexandra Franzen (online entrepreneur, author, coach, ghost writer); Marinela Gombosev (engineer, business and marketing expert, manager, multi-lingual); Eva Haller (mentor, philanthropist, activist, executive and board member of multiple non-profits, Magnusson Fellow); Frances Hesselbein (former CEO of Girl Scouts of America; founder of Leadership Institute, author, editor, Presidential Medal of Freedom recipient); Lorie Karnath (explorer, scientist, author and philanthropist); Lydia Kennard (urban planner, lawyer, former Executive Director of Los Angeles World Airports—during 9/11—, founder and CEO of KDG Construction Consulting, board member of multiple companies); Barbara Lazaroff (restaurateur, interior and product designer, writer, philanthropist, producer, speaker); Jeanne Meyers, Rita Stern Milch, and Karen Pritzker (co-founders of The My Hero Project, and multi-talented in the arts and philanthropy); Lita Singer, Ph.D. (former Wall Street broker, psychologist, professor, author, musician, fine art photographer); Margaret Wertheim (trained in mathematics and physics, science writer, speaker, co-founder of Institute For Figuring) and her twin sister, Christine Wertheim (artist, poet, professor, co-founder of Institute For Figuring). Also included is a chapter on the "Icons," famous RenWomen such as Oprah Winfrey, Hillary Clinton, Condoleezza Rice, Maya Angelou, Jane Fonda, and Arianna Huffington; as well as a chapter about RenWomen from history.